As the name suggests, this is Mega Man/Aki Light equipped with Drill Man schematics. The figure measures in at 5-inches and comes equipped with Drill Man's buster. You can spin the drill by sliding the green dial at the weapon's base. It's kinda fun to fidget with. Unlike the plain 'ol vanilla Mega Man figure, you cannot remove the buster arm to exchange it with another. Design-wise, the figure bears more than a passing resemblance to its CG animated-incarnation. In other words, it's show accurate. Articulation is limited but passable. The head has a nice pivot on a ball joint, though the arms and legs are a little stiff out of the box. The legs and knee joints loosened up quite a bit after use, but the arms remain quite stubborn. Drill Power Mega Man also includes a breakable, hollow boulder accessory. It breaks into four peices that you can "tab" together. You're encouraged to break it with the drill arm! Standing at roughly 6-inches, Air Man is a fine piece of work to look at... and not much else. His arms have an impressive range of motion at the shoulders (thanks, ball joints), but the forearms are stuck in place. Air Man's legs are very articulate and can be posed in a variety of, well, poses. 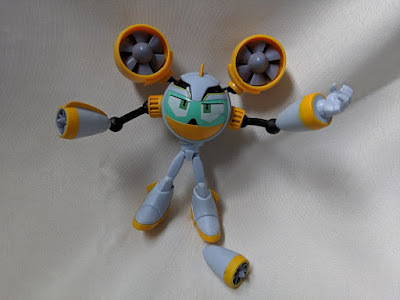 Though he may look top-heavy, Air Man is actually a very light weight figure. He's well-built and survived one or two accidental drop tests. I was disappointed by the lack of any real gimmick, though. While the Drill Power Mega Man had the spinning drill, Air Man's actions are left entirely up to the imagination. You would think his "ear turbines" spun but, alas, they're static. 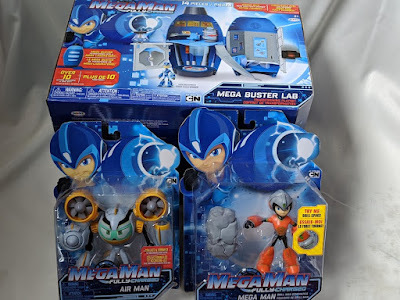 Much like the other Robot Masters in the Fully Charged toyline, Air Man comes with a buster accessory for the vanilla Mega Man figure. The turbine cannon accessory can be swapped out with Mega Man's Mega Buster. This big guy transforms from Mega Buster to playset in seconds. Crack it open from the side and voilà! A decent-sized play area for up to five figures. Before you play with it, you'll need to set aside a good ten minutes to apply stickers and peg-in various accessories. Be warned: the pipe and tubing-like stickers, the ones that you're supposed to apply to the deepest recesses of the buster, are a *pain* to get on straight. I did my best, let me tell you. So what can you do with this thing? Quite a bit, actually. There's a trap door, a disc shooter that shoots out little, octagonal pieces of cardboard with Mega Man's face on it, a slide, various switches and secret compartments, an elevator, a rotating floor, a chair that swivels, and more. The disc shooter, chair, and computer can be attached to one of several "hot points" found throughout the playset. 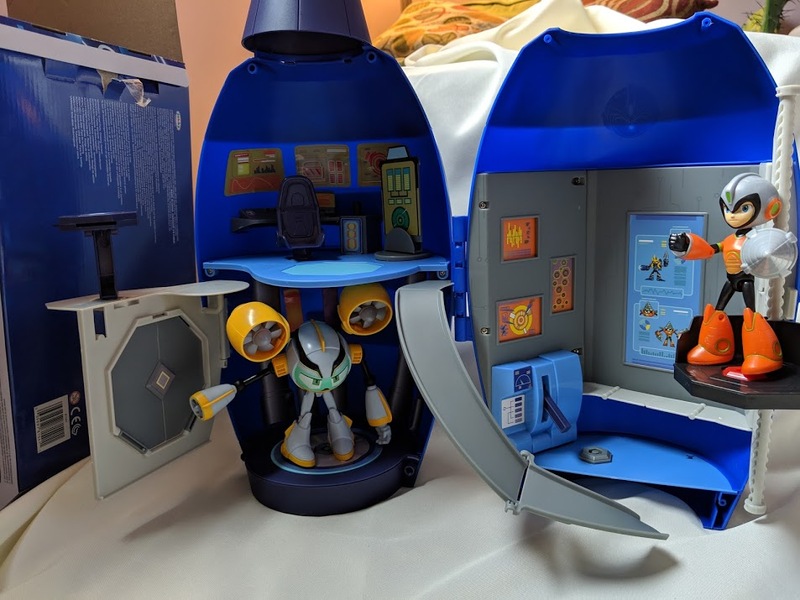 In terms of source material, the playset looks pretty similair to, but not exactly like Mega Mini's hub inside Mega Man's head. I guess kids don't want a playset shaped like Mega Man's head? Regardless the concept is well executed here. It's really too bad that a little Mega Mini wasn't included! Like, no one fits in the chair. He would've been perfect! 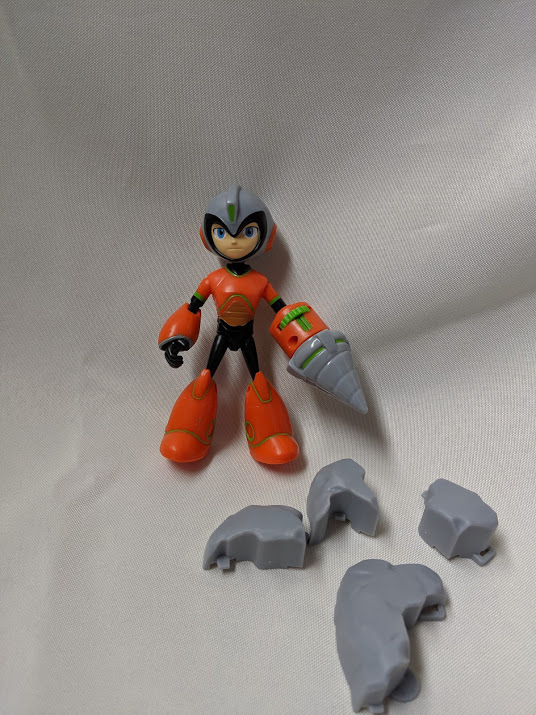 All in all, Jakks Pacific's Mega Man: Fully Charged toyline is off to a pretty good start. Check out all of the figures and toys from wave 1 here. Thanks again to Jakks Pacific for providing the samples! i think i'll never get used to AirMan FC design.